The basis of all energy production is that fossil fuels burn releasing more energy than what is put in to start the process in the first place. Any boy scout can show you this simply by building a campfire. While there are often other by-products of the burning process, the most fundamental equation results in heat energy, carbon dioxide, and water. If you can’t spot it the problem is where the products are coming from and what it we plan on doing with the by-products. Fossil fuels in the earth’s crust are essentially carbon and hydrogen. This mixes with oxygen from the atmosphere when producing the by-products of the burning process. 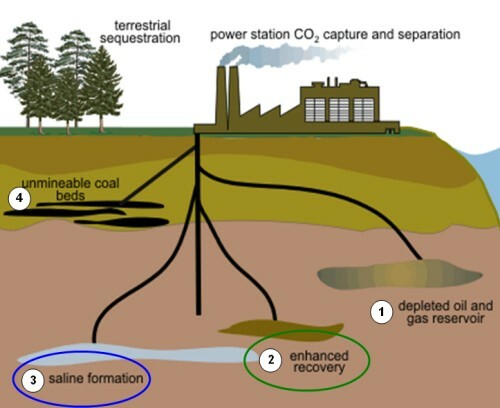 When carbon dioxide is captured and separated from other exhaust gases to be pumped back into the ground, the result is that we are not replacing like for like. What we are doing is sequestering 73% oxygen by volume, not carbon. For every 1 Kg of carbon we take out of the ground less than 1/3rd can go back in the ground based on the same mass. This assumes you can keep the carbon dioxide pressurized and that the surrounding ground around the injection site is not porous to carbon dioxide escaping gas. While the level of particulates are measured in parts per million, the additional 120 ppm of carbon dioxide in our atmosphere at the moment also must therefore imply an increase of 240 ppm of water vapour, a reduction of 120 ppm of oxygen (O2) or 80 ppm of atmospheric ozone (O3) in addition to excess radiative heat. Keep in mind that the 800,000 year historic average for carbon dioxide has never risen above 280 ppms and yet as of today currently sits at 398 ppm (approximate a 40% increase in the last 100 years). Beyond this, the carbon dioxide that is in our atmosphere is rising due to the ocean’s inability to continue to absorb carbon at the same rate we are putting it into our air. The net result of that by-product is increased ocean acidification to the point where it may be doubtful that many, if not all, of our marine ecosystems will survive the next 100 years. None of this is good for the planet. It is not just the human species that is at risk, but all species. Yet while politicians and business leaders continue to argue the merits of doing something, and at the same time using those same arguments to delay doing anything, the problem continues to grow. It is not simply enough to recognize that there is a problem, action must be taken in such a way as to mitigate the short term impact and put in sustainable economic opportunities that eliminate the problem at its source. This doesn’t mean an end to drilling or the use of fossil fuels, but it does mean taking a look at the root of the problem and redefining the problem in new terms so as to develop new solutions. The problem is not the use of fuels for the creation of work energy. The problem is interrupting the cycle of energy transfer. In this case it is the lower level of stored, usable energy in a carbon dioxide molecule, combined with the lack of available processes that can make use of the molecule to do work, which is driving all these other effects. Acidification, increased global heating, reduction in ozone levels, and even lack of economic activity are all being driven by the creation of stable non-usable molecules which cannot be reused at the same rate they are being produced. Develop new processes which use carbon dioxide as a factor of production. In both cases, the defining criteria for success is whether there has been a net transfer of energy. Processes which use carbon dioxide as a catalyst do not qualify as it is the covalent bond between carbon and oxygen which needs to be the fixation of energy transfer. What is more of a challenge is that economically, the most profitable economic activities are all exothermic, not endothermic. While I have no statistics to back this claim up, I would suggest that at least 90% of the world’s economies are exothermic in nature and the remaining 10% that appear to be endothermic (with the possible exception of Agriculture) are simply masking an exothermic end-result. 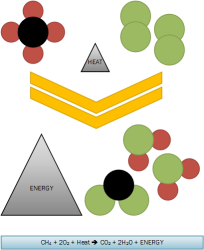 Paradigm Shift: How to make endothermic exchanges of work energy profitable. If we can solve that problem, then issues including global warming will disappear within 50 years. In the meantime, we should not be making the problem worse by unbalancing the equation and putting into the ground the one element on the periodic table that underlies almost every socio-political system, every economic system, every ecosystem, and is a large part of keeping our planet safe from the ravages of the universe around us – Oxygen.